A Bali stopover is perfect after visiting one of Indonesia’s national parks. The packed beaches of Kuta, the cool mountain air of Ubud, attending a festival, or searching for Nemo among coral reefs make it a destination that has something for every traveller. We spend our days exploring world heritage rice terraces, attending a local festival, snorkeling among coral reefs, shopping, receiving blissful massages and drinking cocktails around the pool. Afternoons are spent watching the sun go down on the beach. At night, we eat so much delectable food. 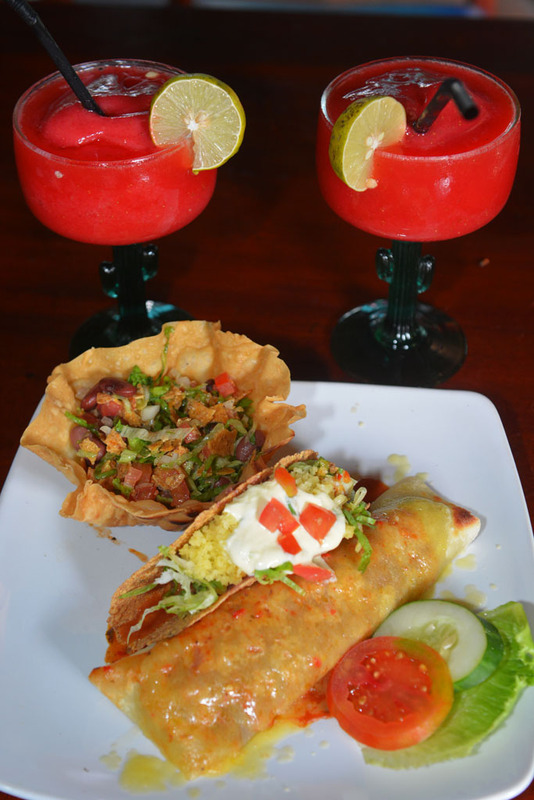 We don’t have the time to try all the vegetarian options. 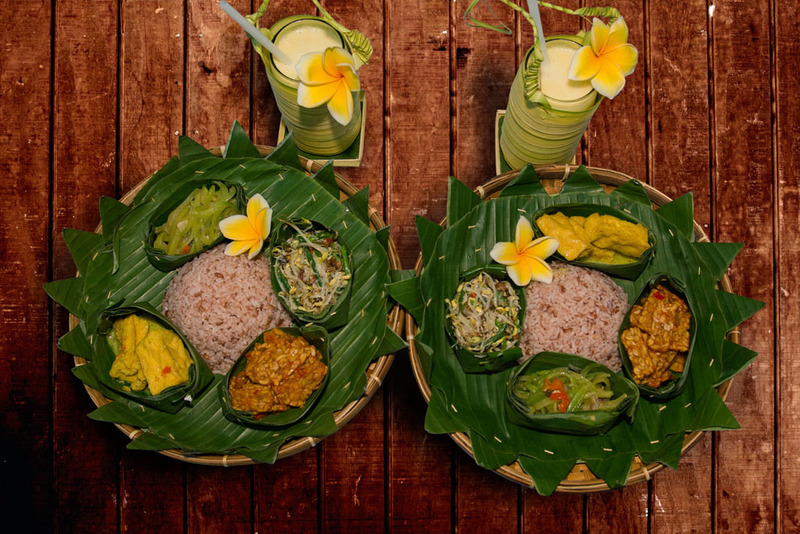 From the traditional gado gado at the local warungs to the local and international cuisine at the restaurants, there is so much choice. In short bursts we love Kuta. The chaos, humid heat, busy laneways, persistent hawkers and cold Bintangs on the packed beach at sunset is all a part of the vibrant Kuta square. We love the ridiculously cheap massages and the local stalls that sell tacky t-shirts, batik dresses and cheap sunglasses. We love the Balinese and their great sense of humour at Kuta. Ubud is in contrast to Kuta. Located in the cool mountains, the Tegalalang rice terraces, monkey forest and organic and vegetarian restaurants make it a beautiful place to visit or stay. Many quaint little restaurants and accommodation overlook the rice terraces. Ubud is a prosperous artist centre and many of the surrounding villages specialise in craft, wood carvings, jewellery, paintings and textiles. Most of the craft can be custom-made upon request. At the Sacred Monkey Forest visitors can interact with the monkeys by buying bananas to feed them. Bananas are for sale at the entrance. The monkeys generally don’t pay attention to anyone without bananas. Most of them are well behaved, but some can jump on you if they think you hide the bananas! WARNING: Don’t try to stop the monkeys taking the bananas as monkeys have bitten tourists in the past! Religion and spirituality are important to the Balinese. 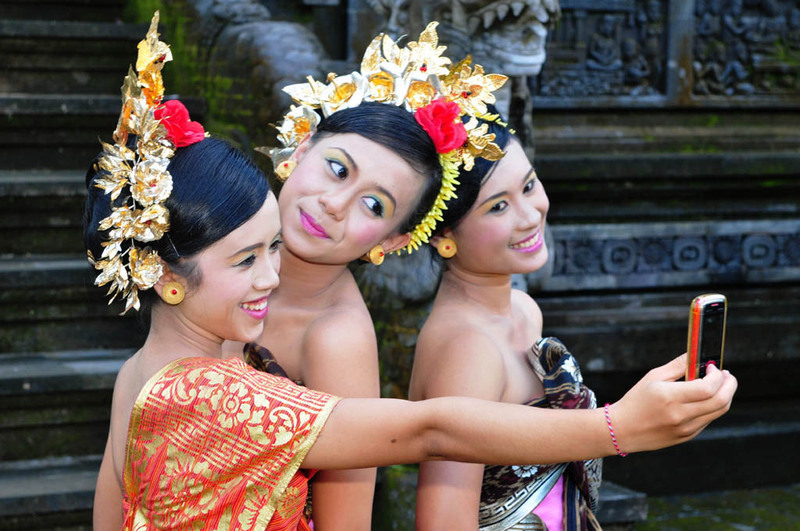 All through the year, Bali hosts many ceremonies, festivals and religious celebrations. 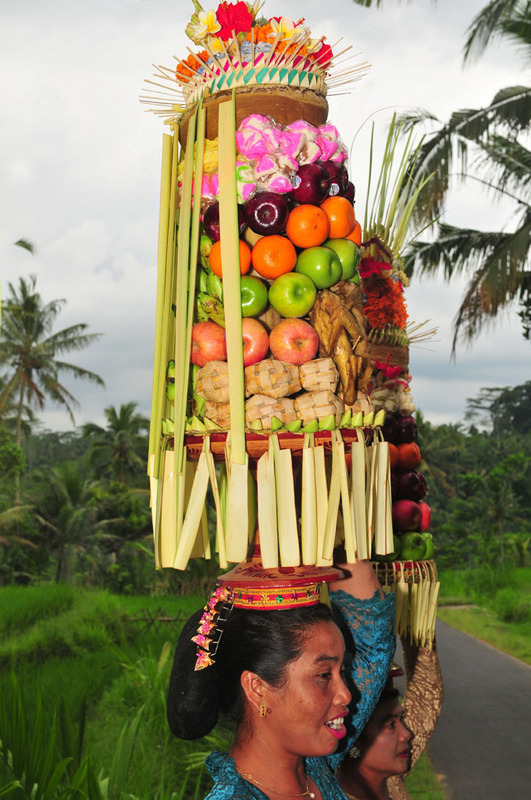 Some festivals are local and some celebrated all over Bali. Our visit coincides with a celebration at Menyali village north of Bali. There is something special about attending a celebration in a local village and the atmosphere is warm and festive. 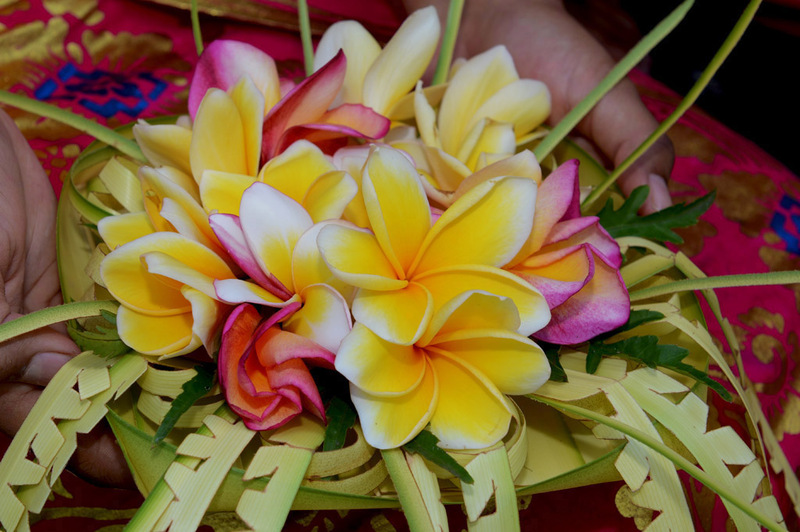 Ladies with their hair adorned with frangipanis wearing traditional dress in shades of fuchsia, lime and burnt orange carry pretty offerings decorated in tropical flowers to the local temple. Men hold colourful Balinese umbrellas, socialise and some play flutes and other instruments. 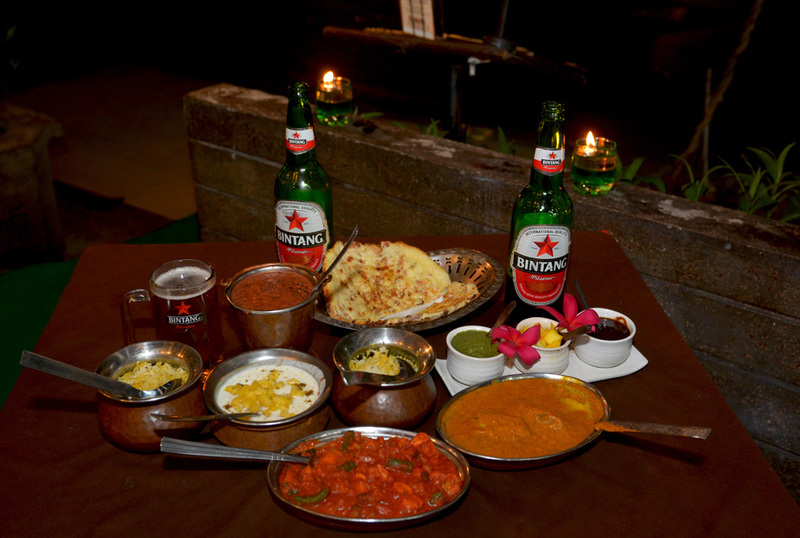 We also enjoy a traditional vegetarian meal cooked especially for us by the locals. The UNESCO world heritage rice terraces of Jatiluwih are the most beautiful in Bali. The village is set amongst green terraced rice fields with mountains in the background. It’s worth staying at one of the rustic guesthouses and eating at the restaurants just for the views! At 700 metres above sea level, the nights are cool. There are a number of tracks through the rice fields for trekking. We do a small trek that lasts for about 2 hours. It’s one of the highlights of our trip with the views and the local people that we meet on the way. Ladies carrying traditional temple offerings on their head weave their way around the terraces on their way to a celebration. The offerings are gifts to gods and sacred ancestors. A labour of love goes into the making of the baskets. Exquisitely decorated with fruits, roast chickens, candies, chocolate cakes, frangipanis and other tropical flowers, they look too beautiful to eat. Surrounded by villages, with dreamy sunrises and black sand beaches, Amed in East Bali is still undiscovered. Quaint rustic bungalows perch above the ocean and infinity pools. Local warungs, restaurants, accommodation and dive shops dot the beach. Spicy cooking and sweet fragrant frangipanis infuse the humid and salty air. 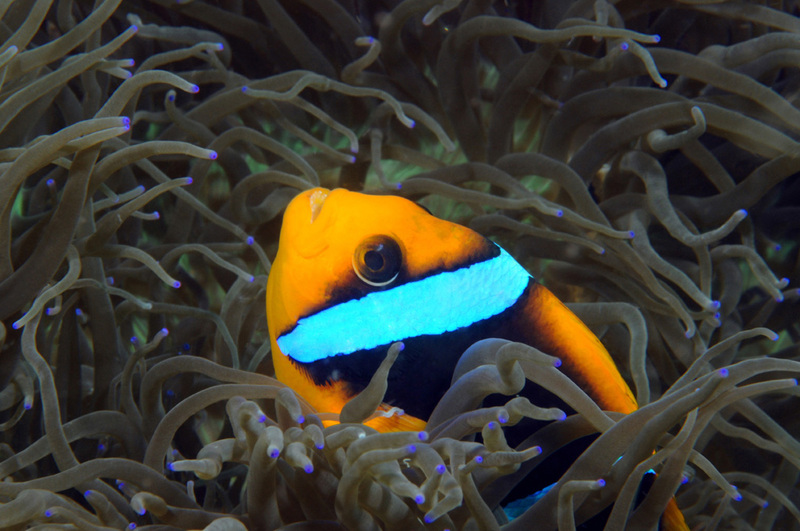 Just off the beach, the warm clear water is home to an abundant of macro underwater critters. Fishermen in their traditional jukungs will also take visitors out in the ocean for diving and snorkelling. Amed is one of our favourite places in Bali. We feel we have it all to ourselves and at times are the only ones on the beach. We would have loved to have gone out with the local fishermen to see the wild dolphins at sunset out of Lovina in North Bali which is about 90 minutes’ drive from Amed, but we ran out of time. Bali is diverse with a variety of attractions and is great value for money. 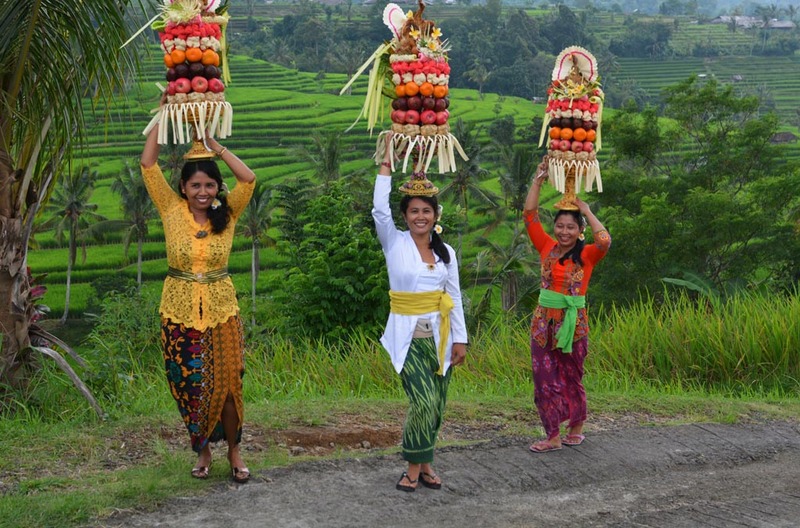 The food, unique culture, climate and the beauty make it an ideal destination or a Bali stopover for most travellers. Whether it’s budget accommodation, drinking Bintangs on the beach or sipping champagne in a luxury villa. Bali is fun for adventure seekers or just someone looking for an idyllic place to unwind by the pool with cocktails. 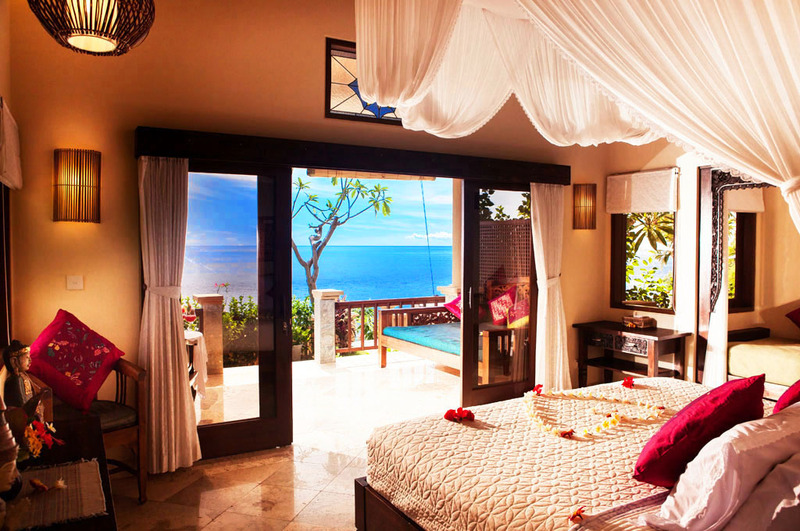 The accommodation options in Bali are endless. 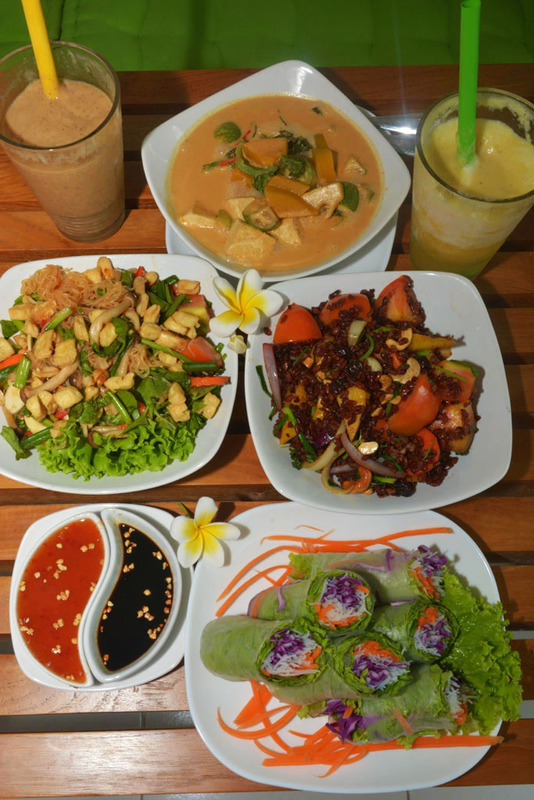 In Kuta, our longtime favourite is Poppies on Poppies Lane. It is right in the middle of Kuta square and one step between being amongst the chaotic street scene and the cosy cottages set in tranquil tropical gardens. Our favourite in Amed is Blue Moon Villas. The cute rustic bungalows overlook the ocean and infinity pool. 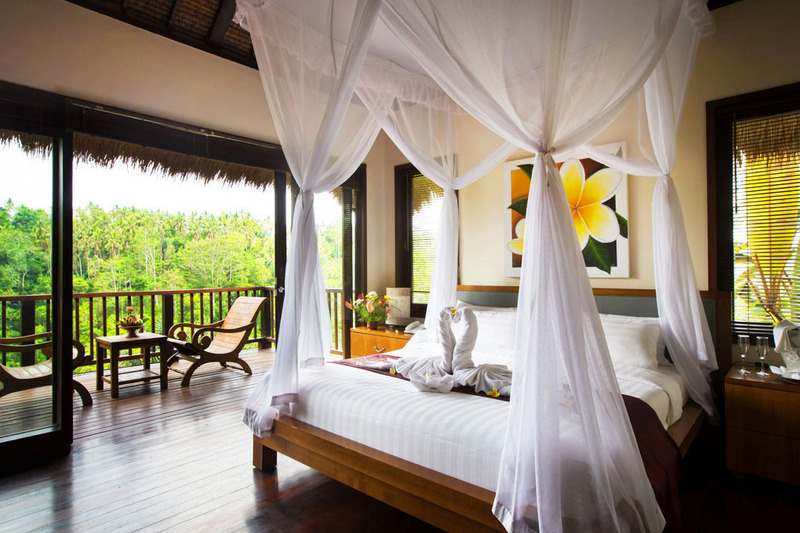 In Ubud, we stayed at Nandini Jungle Resort. One of many beautiful resorts set amongst the rice terraces. Great deals are available with stays in luxurious resorts and villas not costing more than midrange accommodation. During our stay, the special was 60% off for 3 nights stay or more. There is not a lot of vegetarian choices but the homemade vegetarian pasta is to die for. We still drool when we think about the ravioli mushroom with champignons, onion, garlic and cream and the Ravioli Roquefort with a filling of roquefort cheese, walnuts and lemon cream sauce. Has the most extensive vegetarian Indian menu we have seen. Our meal here was like a feast for a king. Serves the best breakfast ever! 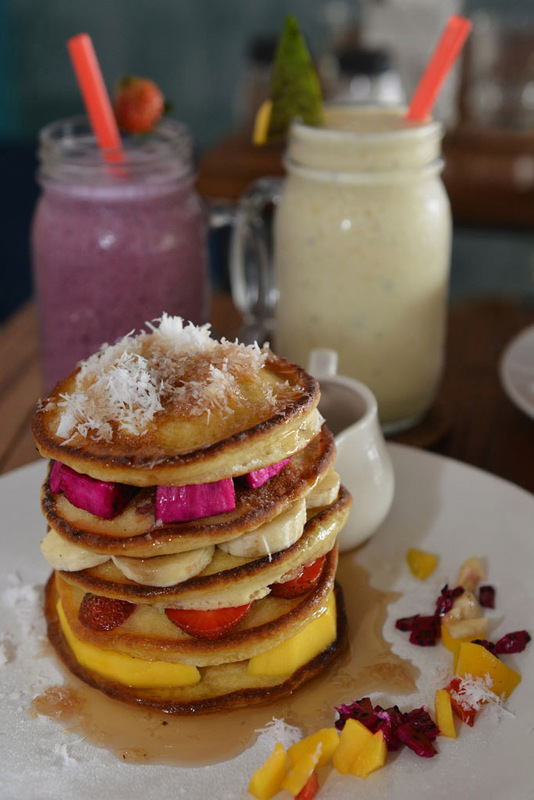 Fluffy tropical fruits pancakes, acai bowls overflowing with goodness and healthy juices and smoothies. Is one of our favourites on our Bali stopover. Healthy plant-based deliciousness with a mix of raw and cooked vegan food. We love the miso baked eggplant and raw coconut white chocolate cake! No Visas are required for visits of 30 days or less. This applies to most nationalities. There is no shortage of ATMs. Most are secure and have access off the street. Our international withdrawal fees are not much more than the domestic fees. The Ngurah Rai airport is about a 10-minute drive from Kuta, which makes it an ideal place to spend the first night, especially if on a late flight. Blue Bird Taxis are the most trusted and they use certified meters. Taxis are reasonably inexpensive compared to most other countries, as the government subsidises them. The airport and most accommodation have lists of the taxi fares between destinations in Bali. Get off the beaten path and see what more Bali has to offer. We got to see a rural part of Bali and met so many interesting people. 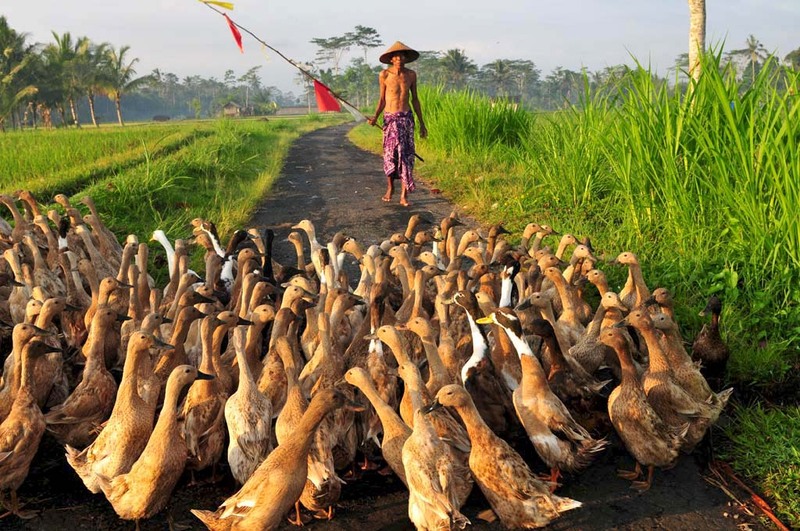 A highlight here was meeting a local duck farmer. He was such a character and so happy to allow us to take photos. The Bali power supply is 220 Volt 50Hz and Type C/F plug. Water is NOT drinkable. Drink only bottled or treated water. There are plenty of Circle K convenience stores and large supermarkets to buy bottled water. Most accommodation supplies bottled water in the rooms. WiFi availability is unpredictable. Some accommodation has it and others don’t. We never had any problem with it during our stay, but others have told us they could never get a connection. Cafes such as Starbucks and Coffee Bean have internet cafes, but it is slow and unreliable at times too. Though bargains are still found, the shopping is not what it once was. It is still fun to haggle the sometimes exorbitant starting price down before buying. A basic guide is not to pay more than half of the original price. If the last price is still too expensive the trick is to walk away. The owner will change their mind if it’s viable for them. We don’t haggle too low, as a few dollars don’t mean much to us, but means a great deal to them. There is something special about attending a celebration in a local village. We had no trouble with the street vendors on the beach. We sometimes buy their souvenirs, as it is a small amount to us and means so much to them and their livelihood. If not interested we don’t get in a conversation with them, avoid eye contact and they move on. Don’t bargain with them if there is no intention of buying their goods. Seminyak – Next door to Kuta and about 10 minutes by taxi. 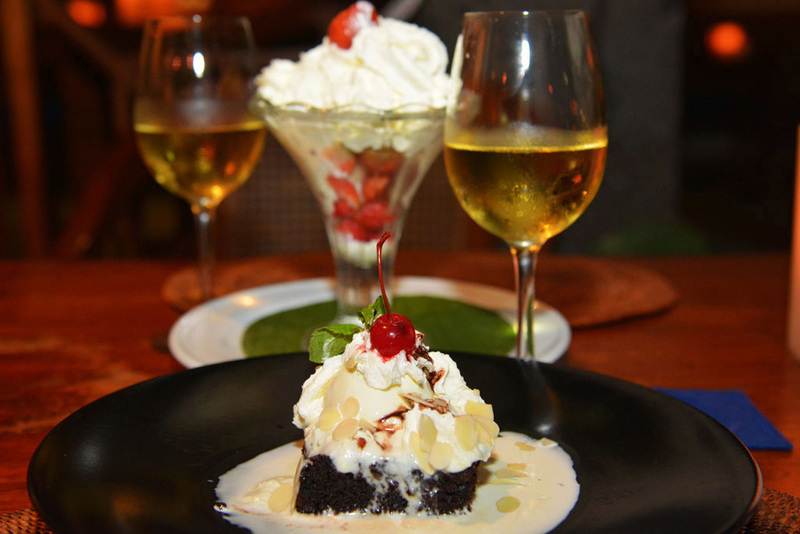 Seminyak is more upmarket than Kuta and has trendier bars and restaurants. It’s more spread out whereas Kuta is accessible by foot. Hiring a bicycle or motorbike is a great idea if wanting to explore Seminyak more. Jimbaran Beach – Famous for the seafood shacks that line the beach – 30 minutes. Bali Bird Park – 1 hour from Kuta and 30 minutes from Ubud. We were invited to the festival at Menyali village by Panca from Panca’s Customised Tours. They are a great tour company that offer standard and custom tours in Bali, off the beaten path adventures, festivals and village stays. Beautiful blog & images. The color & vibrancy are just amazing. I’ve been following your site since your stunning blog about the cassowaries. I am also pleased to let you know that we did see dad & his 2 cassawary chicks in Kuranda last year. An incredible experience we hope to do again. Hopefully we will be traveling in your footsteps again, this time to Bali. If our images are only half as good as yours we will be very happy. Your people shots are out of this world. Thanks for your comment Shelby. 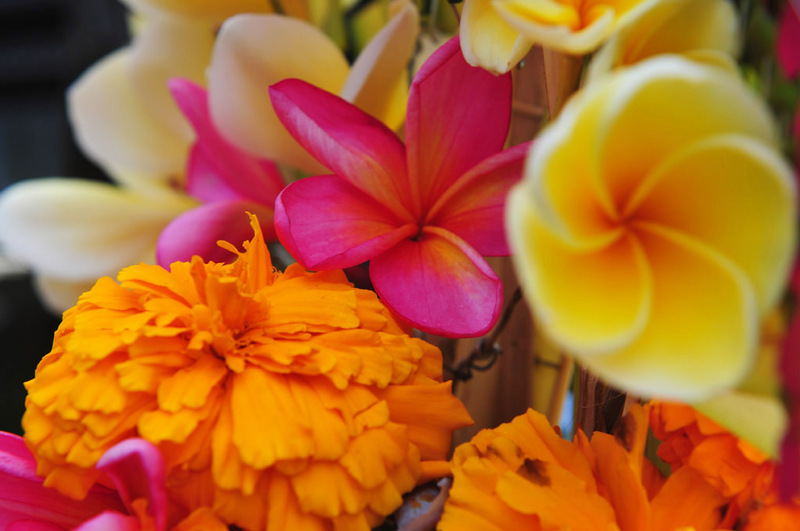 We love the colour and vibrancy of Bali. Glad you made it to the cassowaries, they are magnificent to see & we can understand why you would want to go back. Hope you make it to Bali. Enjoyed your blog on Bali Sue & you are looking fabulous. Have you been further up to the north ? Particularly love your food pics. 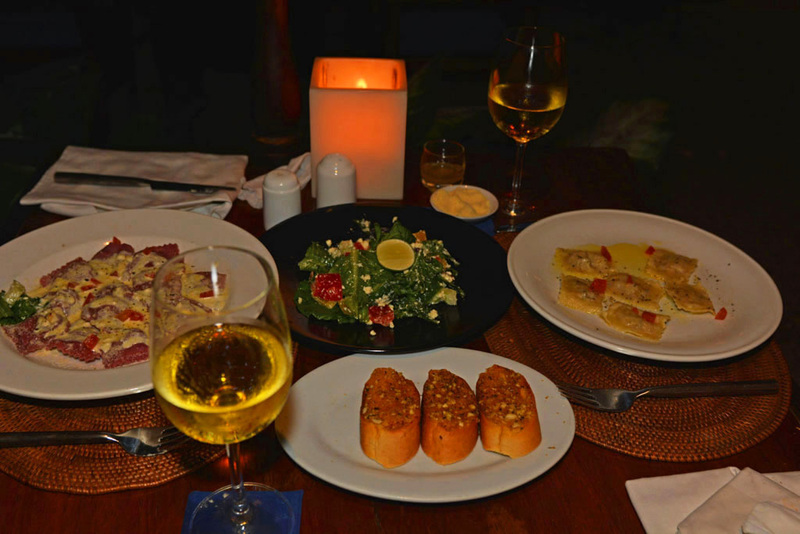 We love our food and Bali doesn’t disappoint! Thank you Leigh! No, we never made it up north. It is supposed to be beautiful though. We would have loved to of made it to Lovina to see the wild Dolphins. Maybe next time. Bali being so small everything is so close and only a few hours drive between destinations. You described very well the tour of Bali with perfect pictures. The traditional dresses of Indonesian girls are much beautiful with tropical flowers and it is only one place of world where we can see the unbelievable combination of spirituality and naturality. 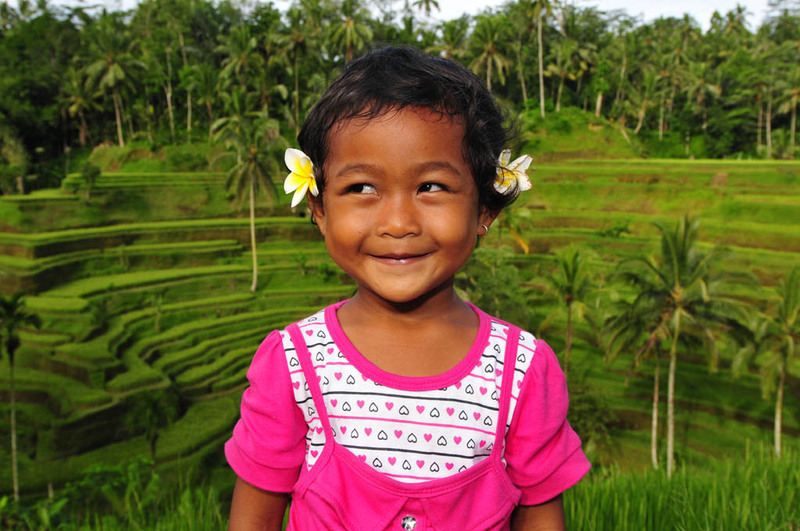 According to my perspective the picture of little dancing girl in Amed is one of best picture of all Bali Stopover blog where the smile of girl is pretty good. The monkeys of Bali are very smart as you described, so no one can hide “Bananas” after read this blog. The persons of Bali’s villages are diligent because they made craft at home. Thank you for sharing great experience ! Bali is a beautiful destination with beautiful people. 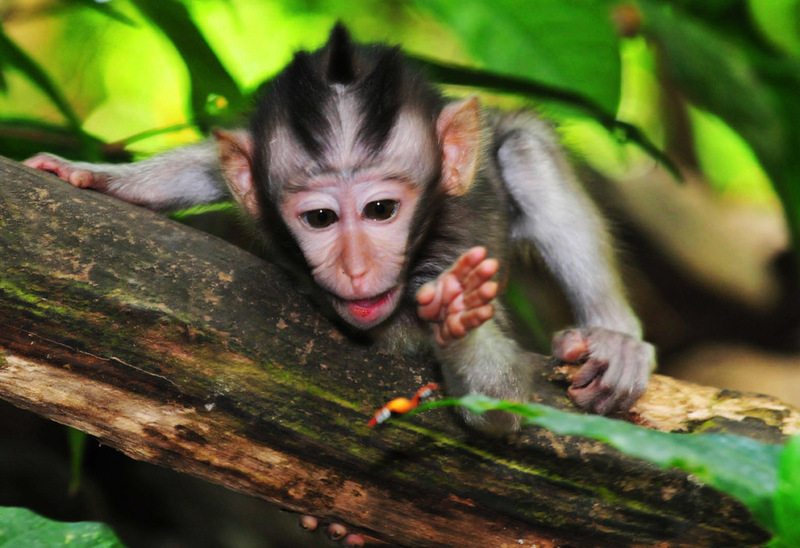 Yes, the monkeys are very smart and also awfully cute! Thanks for visiting and your comment Karan. 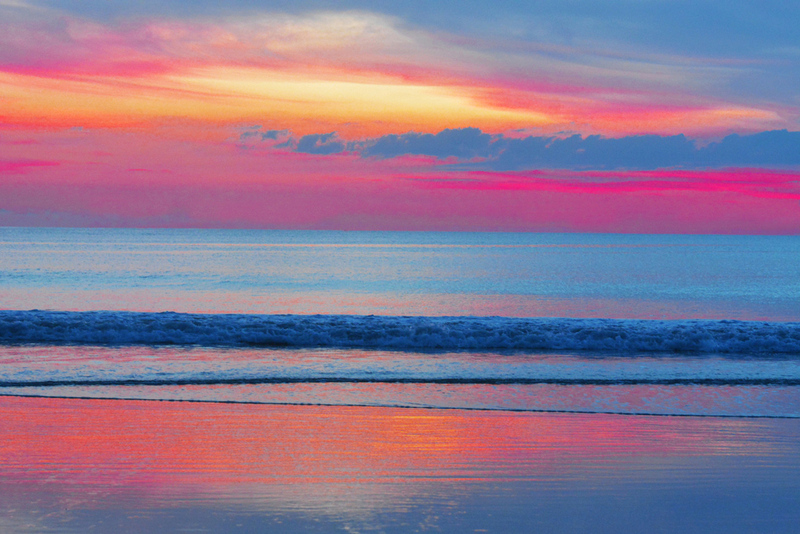 All photos of Bali are gorgeous. I am happy and thank you for visiting this Paradise island and spread the great news of beauty, spirituality and hospitality of Bali. Hope to welcome you back someday in the near future. Thank you Panca. We loved our stay and look forward to visiting Paradise Island again!